I was on a flight home recently after an involuntary extension of a business trip, and happened to be seated next to an aspiring author who felt like striking up a conversation. As we talked, he talked about how he had begun writing to deal with the loss of his mother. That revelation led us down a series of wandering paths, along which it came out that I also write as a form of self prescribed therapy. He asked if I had published anything, and seemed shocked when I told him no (other than scholarly/profesional journals) and that I wasn’t sure I ever would. He seemed surprised and confused. While he agreed that he wrote mostly for himself, keeping the result to ones self seemed inconceivable. Why in the world wouldn’t I try to earn money off of the result. His reaction got me thinking, leading me to analyze why I feel the way I do. The analysis is still incomplete, and probably will remain so, but I have come to some preliminary results that are adequate for my purposes. I suppose there is a fairly big part of me that dreads rejection. What I write is meaningful for me, and I don’t want to be in a position where I am confronted with the reality that paints my work as a picture of futility, triteness, or inadequacy. I am content with the knowledge that I have captured something of myself, and don’t need the approbation of others. However, once exposed and rejected, that withheld acceptance stings in a way that it would’t have had I not gone looking for it in the first place. In seeking for public praise, I risk losing the satisfaction and joy I would otherwise find. While I don’t like the prospect of rejection, that kind of pain is something I have dealt with successfully many times, and would willingly face again if I felt it was worth it. So the question turns to one of determining the cost-benefit relationship and weighing the result. To satisfy the engineer in me, I would normally want to evaluate every aspect and understand the failure modes, associated probabilities, costs, alternatives, and system impacts. This desire to tear apart and analyze the situation is unhealthy in many cases since it often leads to paralysis. However, my nature has been moderated by a life that generally forces me to work with something less than an 80% solution. Given the limited time and energy I am willing to dedicate to this pursuit, I think I’ll settle for 30% in this case and hope reality looks something like what I come up with. The first question that comes to my mind is whether or not anyone who doesn’t have a personal interest in me would find my babblings and musings worth reading. Without an interested market no product can be profitable. This applies to publications just as much as it does to any other product. Unfortunately, I have no clear idea of market dynamics in this segment, and hesitate to even look hard for someone who might have a better read on the situation because doing so risks rejection and unfavorable or nonproductive feedback. Furthermore, marketing myself makes me feel dirty and false while severely grating on me. As an illustrative example, it makes me uncomfortable when my boss plays up my academic credentials in the small environment that is my professional circle. I generally feel that if you need to know that information to take me seriously, you are to shallow for me to waste my time on. However, this kind of self promotion is absolutely required in order to have any hope of success breaking into the publishing world. That kind of self promotion really bothers me. The costs of self promotion are high, but high costs can be justified by good odds of a high payout. Unfortunately, I don’t believe the odds are particularly good that I could reap a reasonable payout. Very few aspiring authors, even excellent ones, ever make much return on their investment. Even if there were sufficient demand for the type of product I might produce, I have no reason to believe the material I could produce would be competitive. What feedback I receive comes from rather biased evaluators and is limited in scope. To my knowledge, nobody reads what I write with an eye to evaluating its commercial potential. Without credible feedback indicating my assessment of the odds is demonstrably false, I have no reason to believe there is a market adequate to make it worth my time and energy. Next on the question list is whether or not seeking publication would still satisfy the needs that drive me to write in the first place. I don’t write to please others. I write to please myself, and I question whether I could maintain that perspective if I were to focus on publication. I imagine it would be like golf… I like the game, but would hate it if I had to do it for a living when the pressure of getting it “right” would disallow the hearty laugh that comes with a slice that takes the ball to the neighboring fairway. I question whether pursuing writing would take the joy out of it all. If I take the pleasure of of it I will have nothing worth writing, and in one fail swoop I would have robbed myself of both my dignity in becoming a shameless self promoter, and an element of happiness in ruining one of the few things I can find the time and energy to do strictly to please myself. Would I like to make money publishing poetry, essays, commentary, and stories? Yes, but I doubt I have what it takes, either from a product standpoint, or from a personal investment in the cutthroat tactics and power plays required to push a good product to market. I am generally happy with what and why I write, and taking steps to make it more than a form of self prescribed therapy would jeopardize that – without a high likelihood of a substantial return on investment. So… After thinking it through, again, I come back to where I started. I don’t plan to look for publication. The three or so people who ever peruse this blog can enjoy it with the added pleasure of knowing they are part of a rather small and exclusive club of initiates. And if you happen to get a chance to read the novel (if I ever decide to finish it) and other short stories I don’t post here, you are in an even smaller and more exclusive club unless something intervenes and changes my mind about publishing. As with any of my stories based in reality, it is true and accurate only to the extent that my memory is correct. This is an account of things as I remember them. Many years ago I felt a strong desire to break free of school and work in order to spend some time tooling around Southern Utah. I had time off, a small pickup truck, and enough money to pay for gas and any incidental expenses that happened to arise, so I made plans to take a bunch of back-roads through the red-rock country. While I might have wanted to spend this time alone, I also had a sister who had just finalized a rather ugly divorce and was struggling to put her life back together. After talking it over with both my sister and my parents, we (my sister and I) agreed to spend spring break together. We threw a tent, sleeping bags, cooler full of food, camera, and a bunch of other gear in the truck and headed out for our first stop on the trip – Moab. The truck I owned at the time was a small, rickety, rusted-out, 4×4 Chevrolet Luv that was almost as old as I was, and was in much worse condition overall than I was. In spite of being four-wheel-drive, the small street tires it had made it ill suited for substantial off-road driving. It wasn’t particularly well suited for street driving either. The doors were so rusted you could see daylight and passing asphalt through them, and they did nothing to keep the overly loud muffler and other road-noise out. To crown it all off, when loaded down with more than just the driver, the truck had great difficulty maintaining anything above sixty-five miles an hour unless I was on a steep negative incline. But… it was what I had, so we set out for adventure anyway. 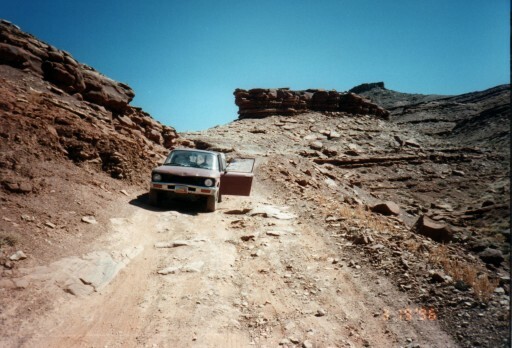 In spite of the truck’s limitations, we made good progress up to the point where we were about an hour outside Moab. Through some unexplainable mechanism, the truck had managed to pick up speed to over 70mph on a 60mph road, and a highway patrolman coming the other direction noticed. He flashed his lights at me, so I pulled over to wait for him to make a U-turn and give me a ticket. However, instead of writing a ticket and sending me on my way with the admonition to slow down, he became highly interested in me and my cargo. This line of questioning progressed in a similar fashion until it finally dawned on me the officer was looking for evidence of a pot stash since I was clearly a college age spring breaker headed to Moab to get high. By the time I managed to convince the officer I wasn’t what he was looking for we had been on the side of the road for probably twenty minutes. In the end, he seemingly forgot that I deserved a ticket, gave me a warning, and let me go. I considered myself lucky that he didn’t decide to make me empty out all the crap I had packed under the shell in the bed of the truck. Had he done that, I would have been there for hours playing a roadside version of Tetris to load it up again. Getting off without a ticket (which I felt I deserved) was gravy. The final point on this interaction came a few minutes later when the CB Radio crackled with someone asking me what I thought about the cop who had me on the side of the road. I looked down and realized I’d tuned it to channel 9, a channel reserved for emergencies, and one that you wouldn’t assume a guy like would be monitoring. The only way someone would have known to call me on that channel was if they had seen the radio. I’m convinced it was the highway patrolman trying to bait me into saying something bad about him. Rather than complain about the incident, I instead replied that he was a good dude, and that the other person shouldn’t be broadcasting on that frequency. We continued on our way without further incident, and spent the next day in Arches national park seeing Delicate Arch and several other spectacular formations. 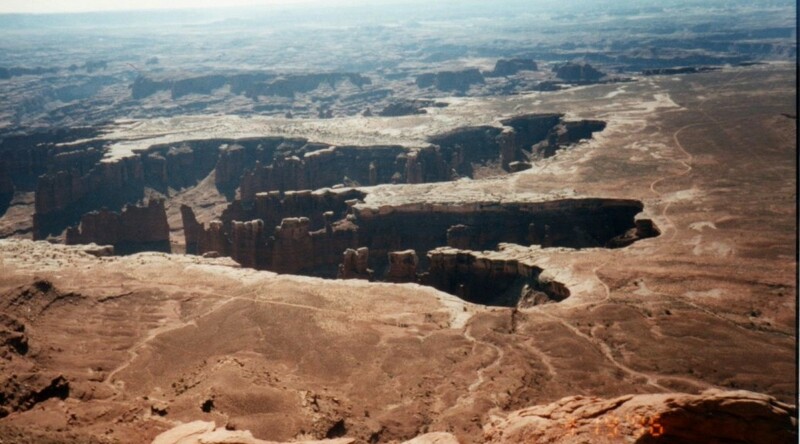 However, the real fun was in Canyonlands the next day. Canyonlands is in reality two separate parks who’s joint-border is formed by the confluence of the Green and Colorado rivers. To the north is “Island in the Sky” and the “Needles” to the south. Another unusual aspect of Canyonlands is that the majority of the “roads” in the park require a 4×4 with good ground clearance. From the Island in the Sky, the best scenery is found by taking the Schaefer canyon trail down a 1500 ft vertical cliff face to the White Rim, a ledge half-way between the Island in the Sky and the rivers. A trail (the white rim road) ran from Schaefer canyon along the rim, following the Colorado river to the confluence and back up the Green river to another trail up to the Island in the Sky. The entire trail is near 100 miles start to finish and extremely rough in places. 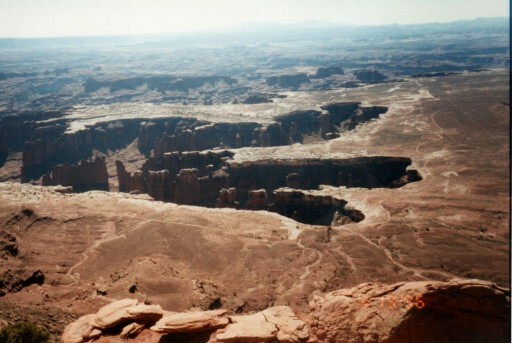 Looking down at the White Rim from Island in the Sky. 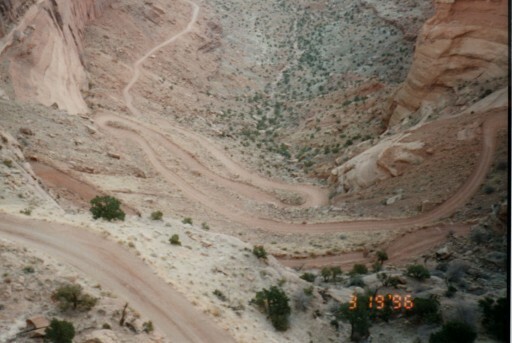 The white rim road is just visible snaking along down below. Undeterred by the bad and steep road, I decided I wanted to head down the canyon to the white rim. No sooner did I start down the canyon road than my sister decided she wasn’t up to it. Being the obliging brother I am, I ignored her and pressed onward down switchback after switchback, having to back up to a wide spot a few times so a jeep coming up could pass. Every turn and steep incline found my sister’s fingers digging deeper and deeper into the dashboard. By the time we hit the bottom of the canyon my sister wouldn’t talk to me other than to insist that she would rather hike out than do that again. Over the course of the day we saw amazing things, but none of it seemed worth it to my sister who found off-roading with me too frightening to continue much longer. Finally, after an aborted attempt at a particularly difficult and steep trail down to the river level, I agreed to head back and get on more friendly terrain. As we were about to turn up the steep canyon road, we came across a man standing next to his mountain bike staring in dismay at the canyon road. He was obviously in distress, so we asked if he could use a ride. The look of relief in his face was palpable. Even the prospect of fitting three across in my tiny truck wasn’t enough to cause a second thought. We tossed his bike in with the rest of the crap in the back and squeezed into the cab together for the long ride up the canyon. Looking down Schafer Canyon. Many of the switch-backs are not visible, and it’s a lot farther down than it looks in the picture, especially when you consider the small green dots at the bottom are decent sized juniper trees. Along the way, this poor man explained that he had left the visitor’s center early the day prior expecting to complete the white rim loop in a single day. He’d read a guidebook that claimed water could be pumped out of puddles along the trail, and that the distance was eminently doable in a day. He had hit the trail without a tent, anything to make fire with, enough water for the day, or any clear idea for what he was getting into. By the time darkness fell, he was halfway through the loop, out of water, out of food, and out of options. 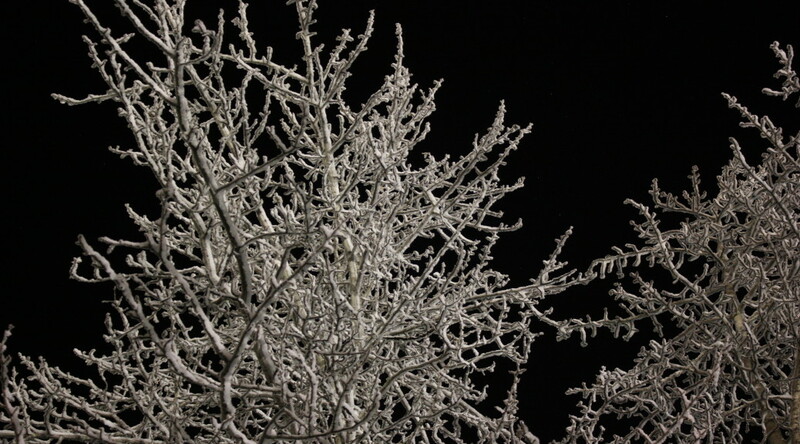 In the high-desert, temperatures drop rapidly when the sun goes down, and while daytime temperatures were in the mid-seventies, there had been frost on my truck that morning and the wind had howled all night long. This poor man had ultimately resorted to taking shelter overnight in a pit-toilet at an unoccupied primitive campground. Without enough room to lie down, he spent the night squatting over the hole and leaning against the wall. Between the cold, his inadequate clothing and shelter, and the sheer discomfort of having to sleep while sitting up in a smelly outhouse, I doubt he slept more than a few minutes the entire night. When day broke, he set out again, rationing his water and hoping to find help along the way. When we met him along the trail he was dehydrated, exhausted, hungry, and unsure he had the strength to climb up that monster of a trail leading back to the visitor’s center. After a drink, a granola bar, and some conversation, we dropped him off at the top of the trail. He gave us a hearty thanks before heading off to his car and hotel room. The next day, my sister wanted nothing to do with rough roads, but I really wanted to explore an area in the needles section of the park that included a trail out to an overlook of the Colorado river. My sister and I made a deal… I would go into the ranger station and ask for intel on the trail, and if it wasn’t bad, we could head out to the overlook. After a young (and rather pretty) ranger assured me that the trail was “smooth sailing and only a little rough towards the end” we took off to see what was out there. She was right about the first part of the trail. 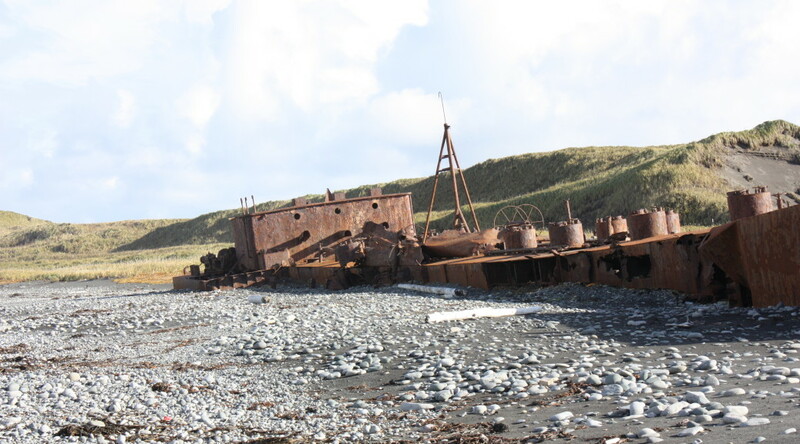 It was flat and coated with a shallow layer of sand that made for smooth sailing. Unfortunately, the conditions changed radically almost instantly… I was over-confident, and going too fast when I saw the drop-off coming. My truck went airborne and we flew several feet before landing on the down-side of a 2-3 foot near vertical drop in the trail. Looking back at the obstacle, I didn’t see any way I was going to be able to crawl back up that rock-face. But… since we were already past it, I decided to press onward and deal with this particular problem later. After all… the trail was only supposed to get a “little rough” and maybe that drop was what she meant. I was wrong about that point. The next three miles were highly uneven slickrock sandstone where I rarely had more than three tires on the ground at any given moment, and frequently heard the scrape of the skid-plates under my transmission and oil pans against the rock. My sister swore she would never forgive me. When we hit the overlook, there was a guy out there with a newer Jeep Wrangler crying over the dents in his oil pan. He looked at me in wonder, openly questioning how I got my short, crappy truck out there. I didn’t have a good answer, and after a few minutes admiring the view, we decided to tackle the trail back to civilization. The ride back is somewhat fuzzy at this point, and to this day, all I can say about how we got over that drop-off is that it helps to have a vehicle you aren’t afraid of scraping up. I’m not sure how I did it, but I’m pretty sure it took a few layers of steel off of the skid plates and a few years off of my sister. As with any of my stories, this is true and accurate only to the extent that my memory is correct. This is an account of things as I remember them. From as far back as I can remember, I have loved opportunities to escape civilization and make my way into the wilderness. Growing up in Utah, there were plenty of opportunities to do so, ranging from the High Uintah wilderness area a few hours east to some of the emptiest high desert on the continent to the west and south. As a kid, my mother’s family made annual trips to both the mountains and to a set of sand dunes southwest of town. 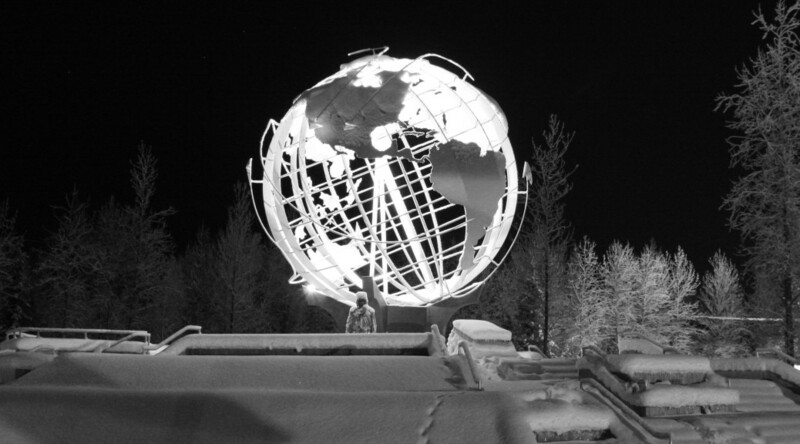 These trips set a precedent that would forever shape my perceptions of what a vacation was supposed to be. Instead of dreaming of Las Vegas, Disney World, or the Bahamas; any time I had the opportunity, I would load up what I needed and make a break for the desert, the mountains, or both. Many of my better memories growing up revolve around camping out in the bush. 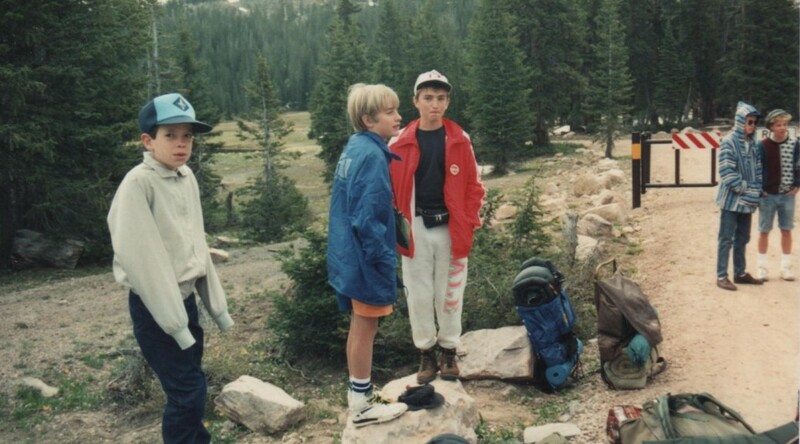 Whether it was with my family, Boy Scouts, or friends, I always felt at ease far away from the conveniences of modern life. One of the things that attract me to the wilderness is the very real sense of the power and majesty of nature. One of the most visible aspects, and one I love to watch, is lightning. Now, I don’t have a lot of first-hand experience with lightning other than watching it as a storm rolls through, but that on its own can be quite powerful. One of the most incredible experiences I can remember was watching, hearing, smelling, then being enveloped by a thunderstorm that rolled across the west deserts of Utah to overtake and nearly drown our camp outside Delta. If you’ve never experienced the feel and smell a desert thunderstorm soaking parched ground, there is no hope of explaining what it’s like. I’ll never forget the rolling thunder and flashing bolts as we watched them approach from many miles away. However, I do have a couple of rather close experiences with this particular expression of nature’s power — both of which occurred in the four-lakes basin of the High Uintah Wilderness Area. Over the course of several camping and backpacking trips through the Uintahs, I learned that the weather at altitude is highly unpredictable – especially in the summer. Many times I’d been caught in a hailstorm when only minutes before the sky was clear and the air was warm. Not wanting to be caught unprepared, I made it a point never to sleep under the stars, putting a tent between me and the rain if at all possible. On my first backpacking trip into the four lakes basin, things had been completely unremarkable other than the scenery. We had arrived at the camp site happy to be at a point where we could stop for a few days rest, and we immediately began setting up camp. I chose a spot in the shade of several large pines with a soft layer of needles covering the ground and set up my tent, feeling quite happy with my selection. The remainder of the day was spent goofing off or fishing without incident. I went to bed tired and happy. 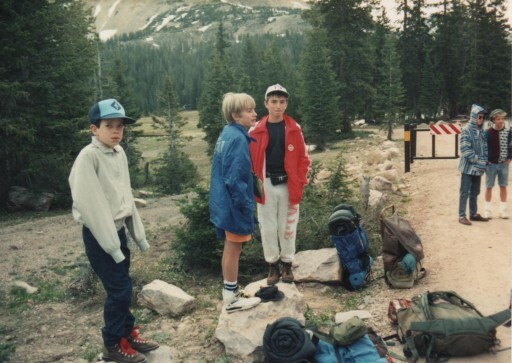 The only picture I have of either trip into the four lakes basin. This picture was taken as we were dropped at the trailhead on the first expedition. From left to right: Alan Lundgren, Mike Brady, me, someone I don’t remember, and Tom Mosier. Somewhere in the night, a powerful storm rolled in bringing hail and lightning with it. I awoke to flashes of light, crashes of thunder, and the sound of hailstones bouncing off of my tent. As I laid there watching and listening to the power of nature, there was a blinding flash accompanied instantly by a deafening crash of thunder. My hair stood on end, and before I could react, I heard the sound of several things much larger than hailstones hit my tent and the ground around it. I wondered what it was, but didn’t dare go out until the storm had passed. The next morning, after watching the sunrise through the golden color of my tent fabric, I crawled out of my sleeping bag, unzipped the tent, and found a large piece of tree bark resting on the rain fly with several large chunks of green wood scattered all around. Lightning had struck a tree only a few feet away and literally blew it apart. Nature’s power is awesome, and I felt blessed that I hadn’t shared the fate of that all too nearby tree. The basin we were in was right on the main trail, and while remote, was rarely unoccupied. The heavy traffic brought lots of fishermen competing for the limited stock in the lakes. Consequently, fishing wasn’t particularly good, and as young men, the thought of depending on a couple fished out lakes for food wasn’t something we looked forward to. After most of a day trying to make due with the played out lakes, several of us took a hard look at the map and decided to hike over “cyclone” pass and along an unmarked trail to a remote lake to see if the fishing would be better where there had been less traffic. Cyclone “pass” wasn’t much of a pass. Rather, it was more of a saddle between two high peaks, with even the lowest part of the saddle above the tree-line (roughly 10K feet). Once over the pass, the trail on the map disappeared, but the lake would be easy to find by following the ridge-line north a few miles from the pass. We took off with minimal gear and supreme confidence in our abilities. We climbed over the pass, pausing only briefly to catch our breath and enjoy the spectacular views, then dove into the unmarked wilderness. After several miles of jumping between Volkswagen Beetle sized boulders we arrived at Thompson lake. The fishing was awesome, and we limited out within a few hours. The hike back to camp was uneventful, if tiring. We had caught enough fish to feed us for the rest of our stay in that area, and the rest of the trip was beautiful and drama free. When our Scout troop returned to the four lakes basin the next year, there was a group of guys who wanted to head back over to Thompson lake and see if the fishing was as good as it had been the year before. I don’t fully remember the reasons why, but I decided not to go with them. If memory serves, I think I was feeling kind of sick and wanted to rest rather than tackle the steep climb up the pass and the mountain-goat version of a trail once I got to the other side. In any event, I was one of a few people who stayed back at camp and watched as everyone took off to head up the pass. Several hours later, a black cloud rolled in with threats of a flash thunderstorm. Almost as soon as this cloud arrived, enormous thunderclaps reverberated through the trees and across the basin. I was glad to be under cover of a rain fly instead of out on the trail, and was sitting back enjoying the sound of the storm when a handful of guys came trotting out of the trees through the rain. They had been on their way back to camp when the storm rolled in. As a matter of fact, they were nearing the top of the pass when they first saw the darkening skies. The ones we saw coming out of the trees had decided they weren’t comfortable standing exposed above the tree-line with a storm rolling in, and had taken off at the best speed they could make to get out of the open. A few, however, had decided that they weren’t in any danger, were too tired to run with their packs, and thought it would be neat to watch the storm from their vantage point at the top of the pass. Apparently it hadn’t occurred to them that a graphite fishing pole sticking up out of a pack would make a pretty good lightning rod. As they were standing up on the pass watching the storm flash and crash, lightning struck close enough to daze them and make all their hair stand on end. These few, who had been too tired to jog down the hill earlier, sprinted all the way to camp. By all accounts, the lightning struck within a few feet of Tommy Mosier. He looked very rattled when he got back to camp, and I doubt he ever took another chance with being out in the open during an electrical storm. As with the previous trip, the remainder of the hike was fantastic as we hiked from lake to lake on a fifty mile trek. However, a full week on the trail doesn’t make for the most fantastic of personal hygiene conditions. By the time we made the last overnight stop at Granddaddy lake, we stank, and we knew it! The thought of going back into town smelling and looking like we did didn’t appeal to us. Since we were still several miles inside the wilderness and hadn’t seen anyone for several days, and since we had a full day to rest at the lake before we hiked out to the trail-head the following day, we decided to strip down, wash our clothes in a creek, and jump in the lake to wash off the worst of the stink and dirt. Something to understand about the lakes and streams in that area is that they are all snow-fed. Even in late August there can still be pockets of snow and ice in shady areas. As a result, the lakes are rarely, if ever, much above freezing. Jumping into one of them is likely to cause an involuntary contraction of every muscle in your body followed by some form of audible exclamation. Jumping in to get clean is a very rapid process… wet, rub, rinse, then climb out and into the sun to dry out and warm up. We had stripped down, washed our clothes and hung them out to dry, and were just getting into the water to clean up when a large group of young women came trundling up the trail and into view. Everyone in the water sunk down to their necks in an attempt to stay modest while we waited for them to pass. Unfortunately for us, they didn’t just continue down the trail. Apparently they had noticed us, and had slowed down to gawk at the spectacle. By this point, I was getting horribly uncomfortable as various parts of me either turned blue or shrank into nothingness. As near as I could tell, they wanted to see something they weren’t seeing with us hiding in the water, wouldn’t leave until they saw it, and I was tired of being cold and wet. I stood up in all of my naked glory, smiled, and walked right through the line of girls who had stationed themselves between us and our camp, greeting them with something stupid like “hello ladies,” or “water’s fine, care to join us?” as I passed. I’m certain they were more embarrassed than I, but I doubt they were more mortified than my scout master. Earlier this week I had the misfortune to have a meeting in the Washington D.C. area that required me to be physically present. There was a blizzard in the forecast, but travel arrangements were made that should have allowed our small party to escape the region before the storm hit. Unfortunately, our return flights connected through a city that was affected by the storm almost a full day before the D.C. area, and our morning flight was canceled. Attempts to re-route my travel through another city before the storm arrived were only partially successful. My travel companions got out before noon, but the only flight available by the time I got through to the travel agent was scheduled to take off two to three hours after the snow was to start. The airline sounded optimistic, but I was suspicious. When I woke yesterday morning, I checked the flight board in the hotel lobby and found that almost all of the flights in or out of the airport had been canceled. There was one cluster, all on the same airline, that still showed as departing on-time. My flight was among them, and it was the last flight of the day that hadn’t already been canceled. I was ultimately doubtful I would make it home as scheduled. However, in an effort not to be hyper-cynical I checked out of my room and headed over to the airport. The hopefulness didn’t last long, however. When I got to the gate there wasn’t an airplane waiting, and conditions were rapidly getting to the point that landing a plane would be quite dangerous. In the two hours I stood there waiting for them to cancel the flight, I don’t think I saw more than two planes land, and neither taxied to my gate. Forty-five minutes prior to the scheduled departure time the airline announced the landing of the last plane of the day — much to the relief of a bunch of passengers headed to Phoenix. Those of us on my flight were left to weather the storm and fend for ourselves for at least the next two days while the airline cleared both the snow and the backlog. To make matters worse, I have another meeting scheduled for D.C. next week. Were I to take the earliest available flight home, I would have been home for only one day before I would have had to get on a plane and come back here. The solution… I make the clothes I packed for a three-day trip last for a week and a half and stay here. Normally, I don’t mind extra time in D.C. because I can spend it wandering the national mall, museums, etc… Unfortunately, EVERYTHING here is shut down, including the restaurants that would provide any alternative to the expensive and crappy hotel restaurant. The METRO, Smithsonian, National Monuments, and just about everything else is closed, and everyone who lives here is holed up in their apartments waiting for the storm to pass and the snow-removal crews to clear their path. For today and tomorrow, at least, I get to kill time in a hotel room with nothing but an Internet connection and 77 channels of nothing to watch on TV. Grows diamond reaching to the skies. This story is true to the best of my ability to remember it. It’s possible that some of the memories have been contaminated or that my role in them has been exaggerated, but any of these types of artifacts are purely unintentional. Unfortunately, some of the names are gone from me forever, so if I leave one out, it’s either out of respect or simply because I can’t remember anymore. Many moons ago my older sister handed me a note written on plain white paper that had been folded several times into a nondescript rectangle. In fact, on initial inspection the only even slightly remarkable outward aspect of this note was evidence that this paper had apparently been in my sister’s possession for a while since it suffered from visible wear and tear including stains to indicate that somewhere along the journey it had encountered a Diet Coke spill. Unfolding it to expose the contents didn’t appreciably change my perceptions. Internally, it was not particularly fancy other than the fact that the handwriting was quite pretty. However, despite its inauspicious appearance, this simple sheet of folded paper ultimately changed my life profoundly. This note had been delivered into my sister’s care by way of her younger sister-in-law who was very close friends with the author. In fact, it was a combination of my sister and this sister-in-law who were to blame for the situation in the first place. You see, my sister’s in-laws held a family camp-out every year at the beginning of summer. I had been invited to attend several times previously by my sister, but had always refused until the year of her second or third invitation when I had nothing better to do (being between romantic interests at the time). Feeling like I could use some time away from civilization to let loose and enjoy a little wild-man time, I agreed and made plans to pack up my guns and gear and follow her out to the remote wilderness campsite. While I was packing my things, the author of the mysterious note had made arrangements to come along with her friend. She too was not romantically committed at the time, and had decided to enjoy the wilderness and companionship that the camp-out made available. The trip was mostly typical of such outings. We hiked to several noteworthy sites, sat around the campfire, shot guns, and generally hung out for several days free from the strictures of society. Over the course of the four day weekend, I ran around dressed like a nut-job in camouflage with a gun on my hip and a penchant for doing anything I felt like without regard to societal norms. Were this the first time I had met myself, I would have probably shunned me as a crack-pot. In spite of this, I did manage to meet the pretty young lady who would ultimately write that little note and learn that her name was Liz. At one point when we were shooting, she and her friend wandered out of the brush and “happened” upon where a few other young men and I were shooting and asked to shoot the guns I had brought. At another point, we had all gone into the very small town several miles away to visit a friend of the the host-family and she had commandeered the piano to share some of her amazing talent in that regard (in part to show off I was later told). Other than that, however, contact between the two of us was generally limited. At some point along the way Liz had found a tick in her hair and was brushing it out to make sure there weren’t any more hidden away up there. Now, I have always had a thing for thick, shiny, beautiful hair, and she had all of the preceding traits in abundance. The motion of her hair as she tossed it around to complete the job attracted my attention, and I found myself admiring her. Once she had my attention, it didn’t take much contemplation to discover a broad range of other highly attractive features, and before I knew it, she looked up and caught me gazing at her. Were this the end of the encounter, it wouldn’t necessarily have been particularly significant. However, Liz wasn’t the only one who noticed my focus… My sister took note. At the end of the weekend, I returned to my regular routine of school, work, eat, sleep, repeat… I had been in an out of several relationships recently, all of which had ended badly, and I was in no hurry to engage myself in another. I was content at that point to focus on finishing my degree and moving on with life. In fact, recent experience had been bad enough that I had sworn off of dating until after graduation (over two years distant). My intentions, however, had no significance to my sister. Every time I saw her, she would harass me about calling Liz. Now, if you know much about my sister, you know that she is persistent. Actually, unrelenting would probably be a better word. For five months she didn’t give up. Either she was completely oblivious to the hints I was dropping, or she didn’t care what I did or didn’t want to do. At first I would simply say I was too busy. Then I mostly quit coming to my parents’ house and holed up in my apartment. However, she saw through my excuses. That, coupled with the fact I had moved out of the apartment to escape a bad situation, overturned all my plans. She began making holes in my schedule for me. Ultimately, the best I could do was to claim I didn’t have her number. While she was determined, stubbornness is a family trait that the two of us share in abundance. Every step forward she made resulted in a step in retreat on my part. I wasn’t going to be pushed into this. Unbeknownst to me, this same pressure campaign had been playing out at my sister’s in-laws’ house. Liz spent a fair amount of time there with her friend, and every time the two were coincident there my sister would harass Liz about calling me. Liz wasn’t as stubborn as me, and at some point became fed-up enough with the pressure that she took out a sheet of basic printer paper and wrote a short note on it for Morgan to deliver to me. This note irrevocably changed the course of my life with a simple message along the lines of “I’m available Thursday, Friday, and Saturday after six, call before I’m booked,” along with her work and home phone numbers. Had I been sane and rational, I would have called both of those numbers immediately, and continued calling them until I had arranged a night out. However, my stubbornness got the better of me. I sat on the note for a few days, then eventually called her house… she wasn’t there. I called her work… same story. And with that, I had done what I needed to do to appease my aggressive sister and considered the matter closed. However, word got back to Liz that I had called, and shortly thereafter she called me. Not only did she call me back, but she saved me the difficulty of asking her out on the first date by inviting me to come to a haunted house that weekend on a double date with her friend. Not being completely stupid and stubborn, I agreed. Liz and her friend made arrangements to “borrow” a neighbors house and cooked dinner for the four of us, including a fine dinner of shepherd’s pie with “dirt and worms” for dessert before we headed out for the haunted house. For the record, I have never been a fan of haunted houses. I’m not the kind of person who is particularly jumpy (in fact, Liz and the kids have never had much success startling me), and I don’t find the stupid costumes either scary or entertaining. However, Liz is somewhat jumpy, and there were several places along the path where she startled enough to get over shyness and grab hold of me. How much of that was just her naturally jumpy nature, and how much was an excuse to make physical contact I don’t know, but either way, the results were quite pleasant. We ended the night driving back to the other side of town in my car where I discovered a previously unidentified advantage of stick-shifts. So long as I was in third or fifth gear, my hand on the shifter would lightly touch her hand while she messed with the channels on the radio. Oddly enough, she couldn’t seem to find a radio station that she found satisfying, and I almost never needed fourth gear. Looking back, it was stupid, and I should have just held her hand, but the timid flirtation was quite fun and still makes me chuckle to think about it. That first date was enough to overcome the inertia I had built up in my intention to remain single until after graduation. Before the night was over, I was contemplating options for a non-traditional second date. The idea of spending an evening in a dark theater where I couldn’t enjoy talking with and looking at her just didn’t sit well. 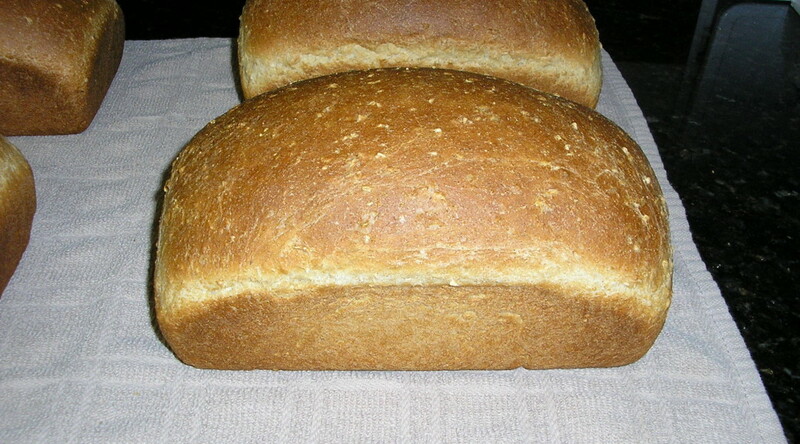 I don’t remember what possessed me, or when I asked, but I invited her over to my parent’s house to bake bread and hang out the next weekend. This was a radical departure from the norm, and contained a significant amount of risk since my family can be a little overwhelming at times for the uninitiated. However, my fears were unfounded. Now, there were a few foundational truths at my house. One of which was that fresh bread won’t last if left unguarded. Before I had a chance to protect it, her loaf had been carved up and devoured by the random horde of people who generally hung out at my parent’s. Feeling bad about this unfortunate accident, I decided the only thing to do was to bake a fresh batch and deliver it in person while it was still warm. Sunday afternoon (I believe… it could have been Saturday though…) I mixed up a fresh batch, pulled it out of the oven, and drove directly to her house hoping to find her there. After I pulled into the driveway and knocked on the door, her mother answered. I hadn’t met Liz’s mom at this point, and wondered what could possibly be going through her mind as she opened the door to a strange young man with two loaves of bread under his arm and an awkward smile on his face. At the time, about the only thing I found more intimidating than the beautiful Liz was the prospect of getting off on the wrong foot with her parents. I couldn’t make heads or tails of what kind of impression this encounter would make. However, if she was concerned, she kept it to herself, and after accepting my cargo she told me Liz had gone for a walk around the block with her kid sister. She also suggested that I might run into her if I went that direction. I did, but to no avail. I returned home without the pleasure of seeing Liz that day. In the end, though, we reconnected, and managed to do so every weekend for several months. The weekend dates expanded into the week to cover basically every day for a few more months until we were ultimately married. While all this happened many years ago, I still get caught admiring her when she doesn’t think anyone is watching, and we still make delicious bread together. One of my kids’ favorite activities when we have new visitors over for dinner is to try and get me telling stories. I’ve told many of these stories so many times that the kids like to start to tell them on their own if I don’t comply with their requests. I imagine some of these stories are among the things they will take with them long after I am gone, but to ensure that they are correct (according to my flawed memory), I’ve decided to write several of the more popular ones down. These stories are true to the best of my ability to remember them. It’s possible that some of the memories have been contaminated or that my role in them has been exaggerated, but any of these types of artifacts are purely unintentional. Unfortunately, some of the names are gone from me forever, so if I leave one out, it’s either out of respect or simply because I can’t remember anymore. For as long as I can remember, I have loved anything that had an internal combustion engine. I don’t think I was quite ten when I brought home my first lawnmower engine that someone had left on the curb for the garbage man. Hoping to prevent my fascination from simply generating piles of junk motors and vehicles that didn’t run, my mom began checking out books on small engine repair from the library and leaving them somewhere I was sure to find them. As a result, I quickly became relatively adept at making old lawnmowers run. I guess I just liked the challenge of taking something broken and getting it up and running again. Besides, I was fascinated by the ability of a motor to turn something as volatile and gross as gas into power. Around roughly this same time, my neighbor Mikey brought home a go-kart that needed lots of help. Mikey, my brother Tolon and I spent a few days working the motor over the best we knew how, and managed to get the thing up and running. All three of us loved the power that came with controlling a motorized vehicle, and we tore around the neighborhood at top-speed — somewhere around 15 miles an hour. By the time I was twelve (it may have been ten or eleven, but I can’t really remember), I had bought an old Gemeni 80cc motorcycle from a friend and pushed it home. Against the preponderance of available evidence, I don’t think my mother believed I would get it running and consented to my buying it while hoping I would give up before I learned to ride it. She was wrong. With some help from my mom’s youngest brother Donald, I was tearing around the neighborhood on that bike within a few days. From then on, I didn’t bother with go-karts and lawnmowers unless they were broken and someone else wanted them fixed. Over the next couple of years, I acquired a range of old, broken-down motorcycles; most of which were older than me and had been sitting in someone’s back yard for several years unmaintained. They also progressed in size and capability. The 80cc bike was successively replaced with a collection of 100cc, 125cc, 175cc, and a 360cc dirt bikes, and by the time I had a driver’s license, I think I owned somewhere around four or five of them. However, my newfound freedom to legally motor down the street spurred a desire to have a street bike. As with the dirt-bikes, one led to another, and by the time I was eighteen, mom had put a hard limit of no more than half a dozen motorcycles at any one time (I had to get rid of almost half of them). My first street bike was a 1979 Kawasaki KZ400 (on the left). 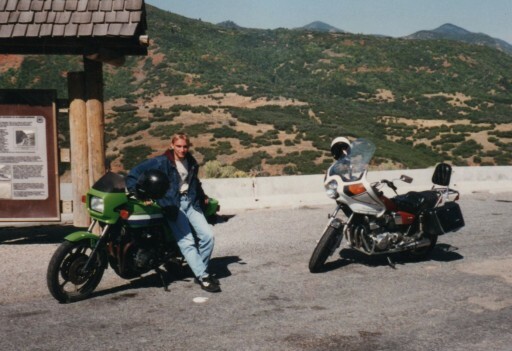 This picture was taken on a ride with my dad (his Yamaha 850 Special is on the right) through the Uintah mountains. There was one bike in all of that mix that I miss more than any of the others though. About the time I turned sixteen, my dad had a friend who was something of a modern gypsy. Mike Osbourne was an entrepreneur with a short attention span. At the time he met my dad, he was traveling from public venue to public venue selling beautifully printed and framed pages with people’s names and the origins of that name. His lack of focus, as it happened, also extended into his personal life, and he had collected a set of girlfriends across the country with whom he would shack-up when he came through town. 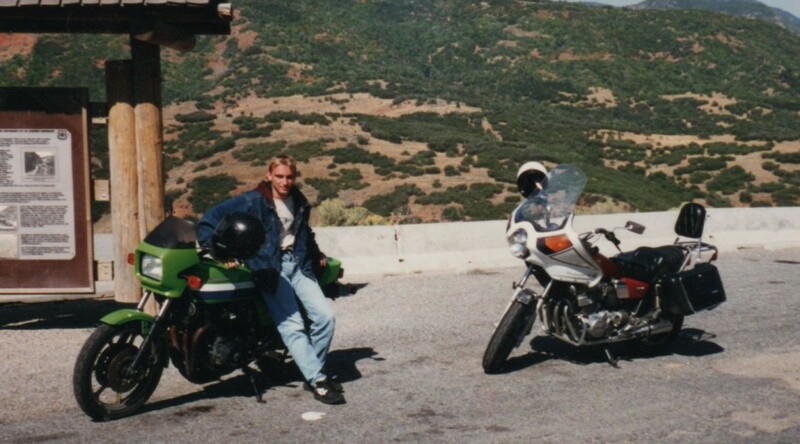 Somewhere back in the very early nineties or late eighties, Mike had wandered through Utah on a motorcycle he had bought new in 1983. For unknown reasons, he ended up leaving the state and leaving the bike in the care of the girlfriend who had been hosting him. However, Mike didn’t make it back to pick the bike up again for several years, during which time the girlfriend had met someone else and become engaged. 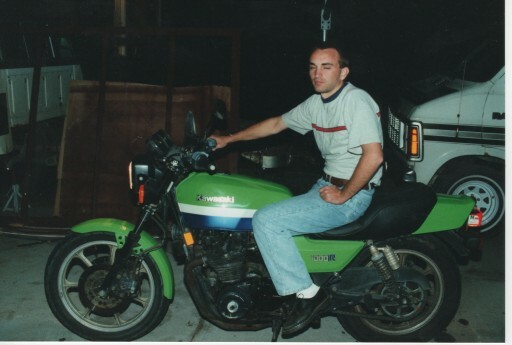 Somewhere around 1992 Mike got a call from the girlfriend telling him he needed to get the motorcycle out of her garage or her fiancé would destroy it. I believe Mike was somewhere in Montana at the time, and couldn’t get there right away. He called my dad and asked if we could go get it for him. He also asked me to get it running again since it had been broken when he parked it. He promised to pay me for the work. Dad had always gone out of the way to help any friend, and it wasn’t like we weren’t used to having motorcycles around, so we climbed in the van and took off for the ex-girlfriend’s house. What we found was a 1982 KZ100R painted up in the Team Kawasaki colors. It looked different… somewhere between a very muscular cruiser and a modern sport bike. I instantly liked it. We brought the bike home without incident, and a neighbor offered me space in his garage to park it while I got it running again. Over the next several months I worked it over little by little and got it up and running again, anticipating Mike’s return. The repaired bike sat in my back yard for the next two years. Eventually, Mike came through town again. At this point, I was in violation of Mom’s motorcycle limit, and I needed to get rid of at least one of my inventory. I was also sore about the fact that I had spent a lot of time and money getting Mike’s bike running and didn’t get to enjoy any of the fruits of my labor. I gave him an ultimatum: Either he get the bike out of there and pay me for the work, sign the title over to me, or accept that I was going to place a mechanic’s lien against it and get the title anyway. At the time, he was living out of a large trailer he pulled with an old van, and didn’t have anywhere to put the bike. Seeing he had few alternatives, he ultimately agreed to just sign over the title. Up to this point, I hadn’t done anything cosmetic to the bike. Just what needed to be done to get it running. However, once it was mine, I embarked on a two-year process of restoration that would include new paint, seat, and a totally rebuilt engine. At the end of it all, I had an almost new motorcycle (except for the scraped-up side engine cover I never got around to replacing). This bike had more horsepower than most small cars, was completely paid for, and was old enough that the insurance companies gave me a deep discount (the first modern bullet bike – the Honda Hurricane – entered production after this bike was built, and they didn’t recognize the model number as being a “fast” motorcycle). It was the best of all worlds. The bike was amazing. It was faster than almost anything on the road. The sport bikes couldn’t match the low-end performance off the line, and the few times I caved in and agreed to race one, it wasn’t much of a competition. Because of it’s age, the speedometer stopped at 85mph, and I could hit that in about four seconds half-way up the tachometer in fourth gear. I suspected the collection of Honda CBR900s that were about hottest bike common in that area could catch me if we ever ended up on a long and straight enough section of road, but it never came down to that. The one time I really opened it up on a straight stretch was on I-80 headed west over the salt-flats. Me and my dad’s Yamaha 850 (that I mostly rode) stopping for a break on a ride with my dad down to Ephraim, Utah to visit his mostly crazy aunt. A friend and I were riding out to Wendover, and he wanted to see if he could keep up with me on a speed-run. He had a newer Kawasaki Ninja 650 and was confident his newer, lighter, performance tuned bike would out-perform me in the top-end. We pulled off a ranch exit and agreed to launch together from the on-ramp and see how long it would take for him to catch up. We took off on the agreed signal and I didn’t see him again until I pulled off the throttle and had coasted back down under the speed limit. According to him, he had pegged out at 140 and the gap between us was still widening. When I pulled back, there was still some throttle, tach, and power left. I never did find out how fast that thing would have gone if I’d really tried. It always did anything I asked it without the slightest hesitation or complaint. All good things come to an end, though… I got busy, then married, then broke. By fall of 1999, I was on contract to the Air Force and couldn’t find anyone to hire me for the six months I had left in civilian life. My commission-based job fixing electronics wasn’t paying well either due to mismanagement driving away our major customers. To top it all off, I was relatively newly married. I was running out of money and options. To compensate, I had started teaching lab classes and grading papers at the university, substitute teaching for the local school district, and just about anything I could find to pay the bills, but things were still very tight. I wasn’t sure how we were going to make ends meet. That’s when I started getting post-cards. One day, out of the blue, I got a card in the mail that said in essence “we want your motorcycle.” They had listed a few specific models of “vintage” bikes they were looking for, and mine was the first one on the list. I was in no mood to sell the bike, so I quickly disposed of the card before Liz saw it so I wouldn’t have to explain why I wasn’t going to sell a motorcycle to keep us out of the red. Unfortunately, whoever had sent that card was persistent, and Liz got the mail the day the next one arrived. I was greeted with a look that meant “you know what you have to do,” as she handed me the card. I ended up calling the number on the card, and the man on the other end started reading off the VIN number to me to make sure I had the bike he was looking for. Without knowing anything about the condition of the bike he offered me $5000 for it. I was stunned, but I also didn’t want to sell the bike. I waffled and told him I had spent a lot of time and money fixing it up. He offered $6000. Liz was oblivious to what was going on over the phone, but I think the look on my face told the whole story. All I could manage was to tell him I didn’t really want to sell it, but that I would call him back in a couple of days. After talking it over with Liz, I agreed the right thing to do was to sell it. I wasn’t even riding it at the time since I couldn’t afford the insurance and registration fees (which were actually minuscule). I called back the next day and he offered $6500 if I could have it to the shipper in two days. I agreed, but with heavy heart. The next day I pulled it out of the shed in my Mom’s backyard where I had been storing it, took it for one last ride, then drove it up to the shipping company where they were strapping it to a pallet and loading it into a truck as I signed over the title. From what I understand, it was bought by a private museum somewhere in Houston. I’ve contemplated finding that museum and seeing it again, but all that would do is make me want it again. I think I’ll let it stay as a memory instead. Just pulled it out of storage for the last ride. The next morning I took it to the shipper. The money paid the bills until I commissioned and went active duty, something I had been stressing over for a while at that point. In our family, we chalk this up to a case where faith and paying tithing results in miracles. I still miss that bike, but in the end, getting rid of it was the right thing to do. I probably would’ve killed myself on it if I’d kept it much longer anyway. I was too fearless, and it was too capable.